Have you been on a guided tour of Yellowstone National Park yet? Experiencing Yellowstone with a knowledgable and local tour guide is the ultimate way to bring the park to life. If you’re using Big Sky as your basecamp for adventure, there are numerous tour guide outfitters that can show you the natural wonders of Yellowstone in a way you can’t even imagine. One of the highlights of summer in Big Sky is the close proximity to Yellowstone. Yellowstone is the ultimate national park. Boasting 3,472 square miles of protected park, there’s plenty to do. 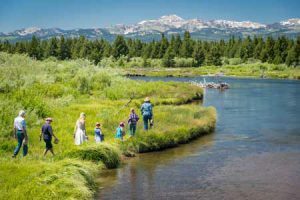 Active geysers, countless waterfalls, towering mountains, endless forests, and abundant wildlife, means that there’s always something new and exciting to see in YNP. If you’re only planning to visit Yellowstone for a short time, how do you even know where to begin? Yellowstone can certainly be overwhelming, but a local guide will always point you in the right direction so that you can fully enjoy the park’s potential. Guided tours of Yellowstone National Park operate throughout the spring, summer, and fall. Snowcoach and snowmobile tours are available in the winter season since the roads are closed to cars. From Big Sky, these tours access the park through the West Entrance, which is about an hour south of Big Sky, Montana. All you have to do is sit back, relax, and enjoy the ride. Every tour is different and it’s your job to find the best tour operator for you. Whether you’re looking for wildlife, waterfalls, or geysers, there’s a tour operator that will cater to your needs. Book a trip and let the Yellowstone professionals show you the park like you’ve never seen it before. They know how to avoid the crowds, spot the wildlife, recommend the best hikes, tell you park facts and history, find the best lunch locations, and more. This is definitely not a complete list of companies that offer guided tours of Yellowstone National Park. 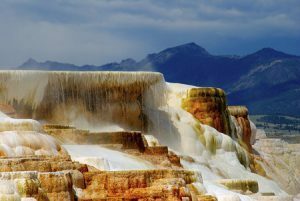 Instead it’s a starting point for you to research different tour providers that offer Big Sky to Yellowstone National Park tours. We highly encourage you to do your research, read the online reviews, and choose the best, licensed tour operator for you and your crew. No matter what tour guide you choose, Yellowstone will not disappoint! Yellowstone is the ultimate adventure. Combine your trip to the park with the outdoor recreation, luxury accommodations, and tasty restaurants of Big Sky, Montana and you’ll have the vacation of lifetime. What’s The Distance From Big Sky To…?